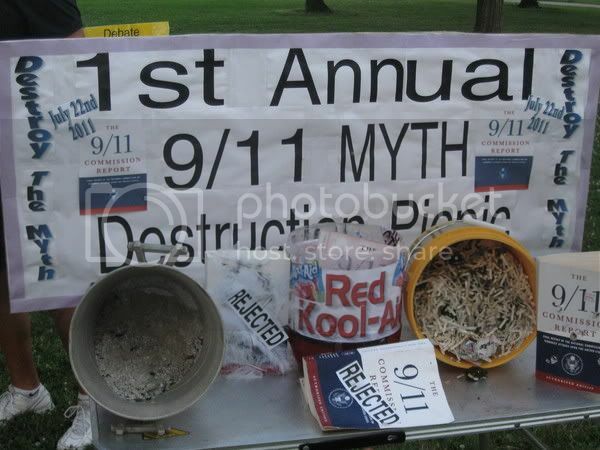 We had our 1st Annual 9/11 Myth Destruction Picnic on the shores of Lake Michigan in downtown Milwaukee, WI on July 22nd, 2011 which would be the 7th anniversary date of the release of the 9/11 Commission Report. Senator Rand Paul sent a letter to Robert Mueller with some questions he would appreciate a response to. anyone ever disciplined, fired, or their career ended for these errors in judgment?" 9/11 Victims Phones Tapped For Details in the Days Before 9/11/01 ? You have to ask yourself why these reporters from News of the World were trying to get details of 9/11 Victims phone conversations before the atrocity of 9/11/01. "Now working as a private ­investigator, the ex-officer claimed reporters wanted the victim’s phone numbers and details of the calls they had made and received in the days leading up to the atrocity." If you live in the Detroit area the AE911Truth 2011 Midwest Tour will be making its last stop in Southfield, MI on Monday, April 18th. I want to personally thank all the coordinators from each of the cities and those that assisted them in promoting this 10 city tour. This event will be filmed by French journalists for a 9/11 10th anniversary TV special. Thanks again for supporting the AE911Truth 2011 Midwest Tour. The AE911Truth 2011 Midwest Tour has now been to 8 cities and has 2 more stops to complete the 10-city tour. The next one is in Kansas City, MO April 16th and the last one is in the Detroit, MI area on April 18th. Please help support this tour. 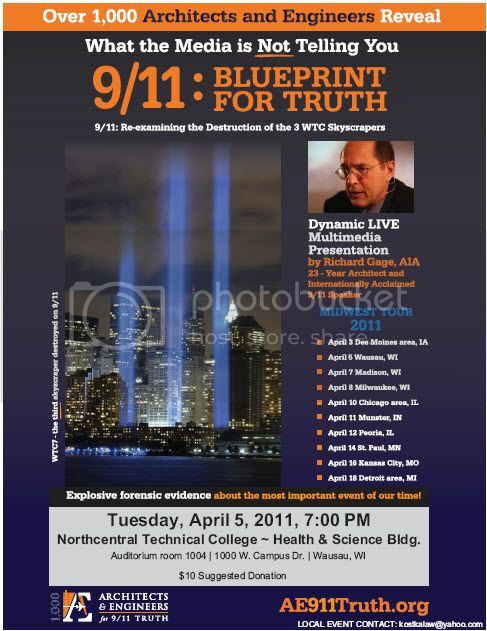 We have three more stops to finish the 10-city AE911Truth 2011 Midwest Tour. St Paul, MN April 14th, Kansas City, MO April 16th and the Detroit, MI area on April 18th. Check below for more details on tour stop locations. Please help support this tour. The next stop for the 10 city AE911Truth 2011 Midwest Tour is Sunday, April 10th in the Chicago area at the Hilton Garden Inn located in Evanston. The presentation starts at 3:00 pm. Please help promote this tour. The 2nd stop on the AE911Truth 2011 Midwest Tour is in Wausau, WI on Tuesday, April 5th. Please help promote the tour. On Sunday, April 3rd Architects & Engineers for 9/11 Truth begins its 10-city Midwest Tour. Please help promote this tour. Richard Gage, AIA will embark on a midwest tour on behalf of more than 1,450 architects & engineers this coming April beginning in the Des Moines area at the Ames City Auditorium on Sunday, April 3rd. The tour will continue into the middle of April with nine other cities on the list of stops ending on Monday, April 18th in Detroit at the Lawrence Technological University. http://www.facebook.com/pages/Architects-Engineers-for-911-Truth-2011-Midwest-Tour/108125165934567 click "Info" page and (read more) to see all 10 city stops with locations, times and contact info. Today Show Mentions Jared Loughner Watched Government Conspiracy Films Like "Zeitgeist" and "Loose Change"
Most of us have 9/11 Truth stories to tell about how we try to reach family members, relatives and close friends with our knowledge of 9/11 Truth. I know from experience that we somethimes don't succeed with those that are close to us. Over the past five years I've been pumping my identical twin brother, Marvin, with the knowledge I have about 9/11, and although he believes me, I never heard of him doing something about it that can have an affect on others. Well, today he sent me this picture and I'm very proud of him because it's a picture of him standing on the street in Las Vegas, where he lives, with a 9/11 Truth sign. I can now officially label him a 9/11 Truther because he isn't just taking in the knowledge he's acting on it. Check out the pic he sent me.